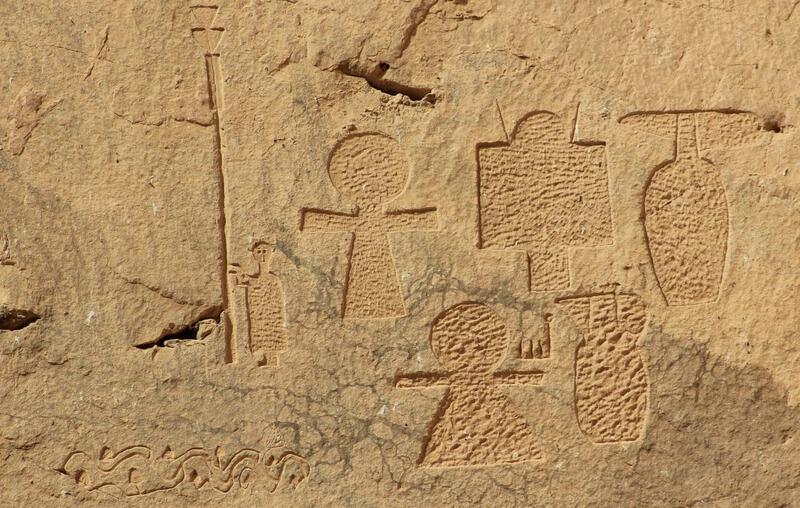 Known to the ancients as Khenu, the ancient site of Gebel el Silsila is located between Kom Ombo and Edfu. Featuring ancient Egypt’s largest series of sandstone quarries -their rocks full with a wide variety of hieroglyphic, hieratic, demotic, Greek and Latin graffiti, petroglyphs and elaborated pictorial representations- as well as a numbero of architectural monuments -the Speos of Horemheb being the most prominent-, it can be considered as one of the most diverse archaeological sites in Egypt. This is the scenery where archaeologists John Ward and Maria Nilsson (companions both at work and in life), are pursuing an ongoing and pioneering research, recording and de-coding visible and not-so-visible remnants of the far and more recent Egyptian past. Series of Roman quarry marks - graffiti in the main quarry. Photo: M. Nilsson. The archaeological couple were called to continue the research of the late Ricardo Caminos, who managed to publish a volume of his work on documanting the site’s monuments before passing away. Aiming to “conduct a comprehensive archaeological survey including also the site’s less monumental features”, Drs Ward and Nilsson started their work from the part of the site located on the Nile’s East Bank. During the first season of their work, they managed to record almost 3000 quarry marks and some 500 textual inscriptions. ”Every epigrapher knows that the game between light and shadow can cause problems when recording; some examples are so faint that even after various visits, inscriptions still evade the viewer until the sun reaches a certain point and finally illuminate a hidden inscription for a brief moment”, the team reports on the ARCE website. “During the first season (2012) the epigraphic survey concentrated on documenting late Ptolemaic and early Roman quarry marks and inscriptions. The preliminary textual analysis indicates expressions of principally personal piety and adoration (proskynemata). A stylistic pattern emerged from the analysis of the quarry marks regarding their placement and character, and indicates a non-uniform application ranging from technical sketches, identity marks or symbols related with Graeco-Egyptian deities and some with apotropaic significance. Additionally, an overall topographical survey of the east bank revealed 49 separate quarries, labelled in accordance with a numeral system from north to south – Q (quarry) 1-49, with focus 2012 on the main quarry (Q34). Due to its great size, this quarry was divided into seven partitions (A-G), each one recorded with its individual quarry faces. General plans were drawn of the quarry and the quarry faces, marked with all epigraphic and technical (extraction) details. General topographic results revealed 54 stone huts in Q34, divided in five sectors built on strategic locations on higher grounds overlooking the quarrying area and with a network of pathways connecting them”, they continue. 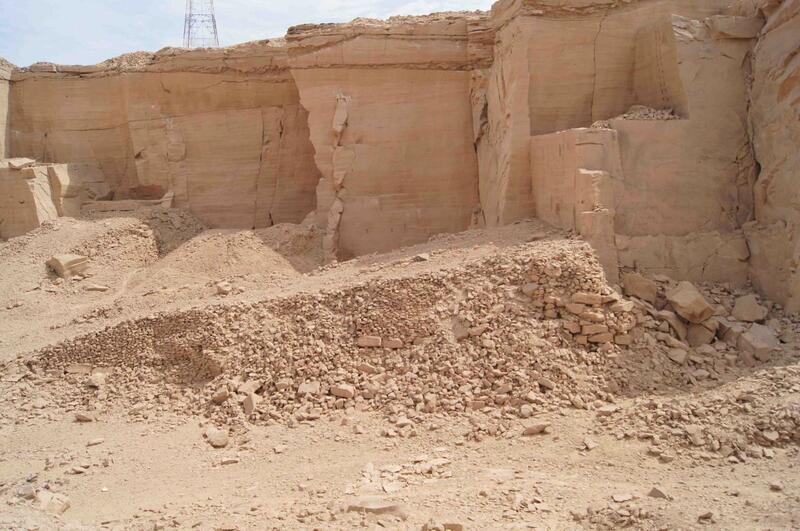 This spring, the team resumed work on the East bank during a seven week season aiming to complete the documentation of the Ptolemaic and Roman quarries, to move on into the Ramesside quarries, and if time allowed it a peek also into the quarries of Amenhotep III-IV for preparatory reasons. “Among the graffiti recorded this season, two previously unpublished round-topped stelae stood out: located in Q37 they display in their upper partition the traditional winged solar disc, adorned with pendant uraei, and contain demotic texts written in white, conveying dedications to Isis and information about the work carried out during the time of an undefined Caesar. These inscriptions and their likes provide a personal insight into the daily work routine and transform the quarries from the purely practical origin of building materials (i.e. sandstone) to an environment in which a thriving community can be visualized”. On the topographical exploration of the Ramesside quarries, the team reports: “The landscape, which to the untrained eye looks no different in any given direction, holds certain characteristics that soon bring the site to life and paint a picture of events that occurred. These details describe the development from surface quarrying to extraction in closed galleries and yet again to open quarries, and explain the development from exploratory extraction to the cutting of causeways to facilitate the removal of blocks to the quays and awaiting barges. By studying the ancient pathways and causeways a chronologic progress appears, describing a working progress from north-east towards south-west. This is indicated by an extraction process that cuts deeper down into the mountain and that abruptly terminated any previous remains. A relative chronology emerges also from the various techniques presented on the quarry faces, measurable in tool marks, splitting techniques, postholes, foot-holes, rope-holes, etc. Information is found also in the trench-making (if any): aligned trenches and marking systems lay engraved and chiseled out of the living bedrock, providing a greater understanding into the development of how the blocks were removed in quantity and quality. Following fissures and anomalies in the stratification, it is evident that the quarrymen adapted and took full advantage of the natural landscape, and thereby increased their yield of stone in the process. Of course, all these details are combined with contextual archaeological material, and the placement and contents of the spoil heaps that now hide much of the ancient landscape”. Two ramps in the main quarry provide details about the development of quarrying and methods of transportation. Photo: M. Nilsson. Based in Upper Egypt, Drs Ward and Nilsson are to continue working at the quarries for an autumn season, and despite the current political situation in the country. During that season they are planning to study a number of interesting finds yielded during the last days of the spring season. “As for most archaeological missions the last days on site resulted in some truly interesting findings, especially while sneak peeking into the quarries of Amenhotep III-IV”. We are looking forward for more exciting discoveries!